Simon Edwards, along with his wife Karen, lead Walk Ministries in Tunstall, Stoke-on-Trent. They also run a building company that supports the ministry and employs men as they come out of prison. Simon has a heart to see the Body of Christ come together in unity. He met Jesus inside a prison where many churches worked together, unified in Christ. And these churches saw nearly 900 men come to faith. The life of Simon has included 27 prisons, 4 children homes, 18 sets of foster parents and 2 police sieges, as well as an addiction to violence, drugs and speeding cars. But now Simon loves life at such an exciting pace in Christ that God fills all his needs with a smile, and a chuckle! He is determined to share the Gospel with everyone he meets. Each day he thanks God for his Karen, their 3 children and the future that Jesus has given him. Simon and his wife attend Ball Green AOG Church, Stoke-on-Trent. Martin has been a minister at Rising Brook since 1998. He was previously leader of The Bear, a youth church in London and part of Ichthus Christian Fellowship. Martin has a degree in English and Drama, and has experience in acting and directing. He has also worked for Pecan, a charity that helps people from disadvantaged communities into employment. 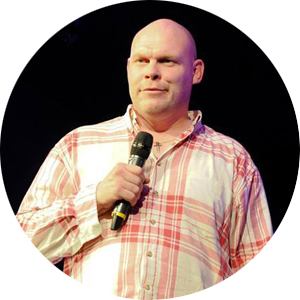 Martin speaks at national and international conferences, and has a leadership role in local projects with other churches. Martin grew up in Stafford and was part of Rising Brook before he went to London. He is married with two children.